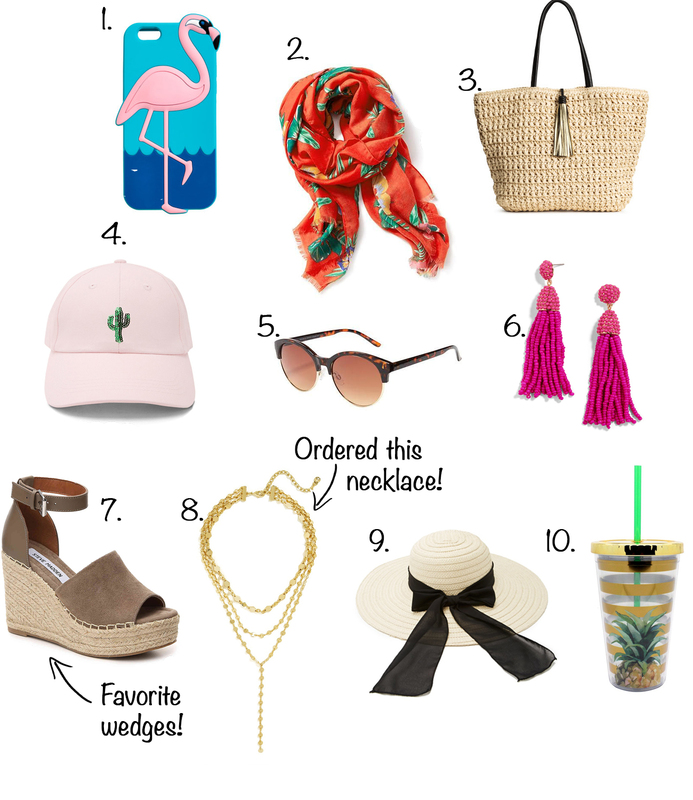 How fun is this flamingo phone case! Too cute, and under $10! This scarf comes in numerous different prints! It would be cute paired with a tank in the summer! Its under $20! Carry all of you necessities to the pool in this little straw shopper! Love the tassel! It is under $25! How adorable is this little cactus hat!? It also comes in white and is under $10! The half-frame sunnies are so in right now! These come in 2 other colors and are on sale right now for only $6! I have a pair of these earrings and I love them!! The pink is super cute for summer & under $40! My fave wedges!! I really want the black! They are right under $60! I just ordered this necklace! These chokers are all the rage lately! BaubleBar also has some other cute ones like this, this and this one, but the Aimee-Y was my favorite! Love the black ribbon around this hat! Such a cute hat to wear at the pool or beach and is under $15! Its rare that I don't leave the house without water, so I have my little collection of tumblers I use! This tumbler is so adorable! & under $10!